San Francisco police officers got the call at 11:35 p.m. on Saturday — there was a domestic disturbance, possibly a weapon. They arrived at the Russian Hill apartment to hear Damian Murray threatening his wife and two children with a gun. For three hours, crisis negotiators worked to calm Murray. And then, in quick succession, a gunshot fired from within the apartment, officers broke down the door and one of four shots hit Murray. He died in the hospital later that night. The officer-involved shooting triggered five investigations, but if the past is an indicator, it will take at least 22 months to complete any of them — a time frame a San Francisco Civil Grand Jury called “unacceptable.” The 2016 Department of Justice report agreed, noting that only one officer-involved shooting case had been closed from the period between 2013 and 2015. That, however, has yet to happen. “In terms of best practices, the reality is that there’s a lot of concerns,” said Max Szabo, a spokesperson for the District Attorney’s office, which handles one of the five investigations. 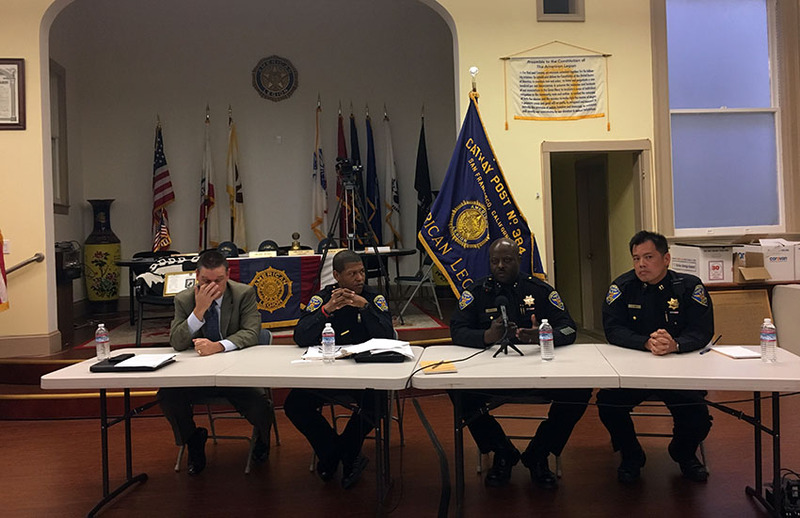 The others include two at the SFPD — one by Internal Affairs and the other by the Homicide Detail — a fourth by the Department of Police Accountability and a fifth by the Medical Examiner’s Office. John Crew, an ACLU attorney and former head of the Northern California Police Practices Project, said the SFPD unfairly hides behind laws and statutes, and that the problem is not legal, but cultural. And, as it turns out, Los Angeles finishes its investigations considerably faster — a fact that could bode well for San Francisco, since Police Chief Bill Scott, who took over the SFPD in January, comes from that culture. Take the investigations that followed the police shooting of Luis Demetrio Gongora Pat in San Francisco and Cesar Frias in Los Angeles. A homeless 45-year-old unemployed restaurant worker from Yucatan, Gongora was shot and killed by police officers on April 7, 2016. The officers said Gongora “charged” at them with a knife, while six eyewitnesses disagreed. Despite numerous calls for expediency and nationwide attention, 18 months later, the various investigations are still underway. The day before Gongora was shot in San Francisco, Los Angeles officers shot and killed Cesar Frias, a 20-year-old mentally disturbed man. The shooting immediately prompted three investigations, including inquiries by the LAPD’s Force Investigation Division, the Office of the Inspector General and the L.A. County District Attorney’s Justice System Integrity Division shooting team. Twelve months later, the L.A. Board of Police Commissioners prepared and adjudicated a detailed report on the incident and published it on their website. It contained a detailed 20-page summary of the standoff, which lasted seven hours and ended when Frias ran toward the team of SWAT officers clutching a pair of scissors. The timeline of this investigation aligns with the LAPD’s other investigations into officer-involved shootings from 2016. Captain Patricia Sandoval, a commanding officer in media relations for the LAPD, said that their investigations take a year at most. San Francisco police officers say that their investigations take a long time because of the number of overlapping investigations.